In last week’s edition of this column I told you “Unfortunately as the season goes on there will be more players in this column.” And good lord did I underpromise and did the NFL over-deliver. I forgot that grown men running into each other at breakneck speeds (pun not intended, but regretted) are more likely to get injured than a right fielder standing out in a grass field who might not have a ball hit to him the entire game. I guess I’ll have to adjust. I also wrote, “This might evolve a bit in the early weeks as I find what works for football injuries.” And here we are with evolution 1! Just consider this the Wartortle edition of this column. With baseball teams having the benefit of a 10-day disabled list, having a stash/trash section and some recommended additions made sense. Not so much for football. So what I’ll be doing this time with so many players and so much uncertainty surrounding each injury I’ll be breaking the players down into groups: players who are questionable, but I still trust going into this week, players who are questionable, but I don’t trust and then the doubtful players and what my thoughts are on them. If you’re looking for players to add, may I recommend my waiver wired article from earlier this week: Waiver Wired, Week 2. As always, follow me on Twitter: @KerryKlug and drop your comments below and I’ll get back to you! Davante Adams, WR, Shoulder, Questionable: As of Wednesday, Adams hadn’t practiced but is expected to play in his week 2 match-up against the Vikings. I think he’s going to play, but his fate is tied with his QB Aaron Rodgers. If Rodgers is out, give Adams a bump down in your rankings. DeShone Kizer cannot make the same type of tough passes that Rodgers can against a tough Vikings defense. If Rodgers is in, play Adams as normal. Trust. If you scroll down you’ll see my opinion on Rodgers — or you can scroll up and see which category Davante is under! Spoilers! Corey Davis, WR, Hamstring, Questionable: Marcus Mariota should be good to go and I expect Corey to be good to go as well. He was limited in practice, but I’m feeling that was just a precautionary diva measure. Leonard Fournette, RB, Hamstring, Questionable: We won’t know until the weekend unfortunately. My guess is they RICE him all week making us sweat — but ultimately he’s starting this weekend. Ted Ginn, WR, Knee, Questionable: I think Ginn didn’t practice on Wednesday just as a precautionary measure. He’ll be in there against Atlanta. DeAndre Hopkins, WR, Foot, Questionable: Limited at practice means they’re just taking it easy on the man. Put him in your lineup fool. 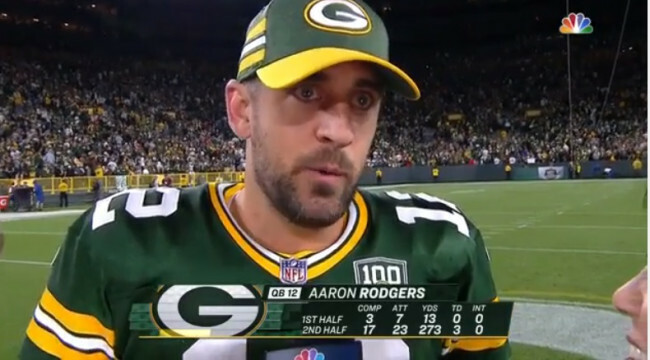 Aaron Rodgers, QB, Knee, Questionable: Hard to say this early whether or not Rodgers will play, but I’m going to make a stab at it anyway: I think Rodgers will be starting for the Packers on Sunday. Especially if they give them some of those wowie zowie pills they gave him during last week’s game. Austin Seferian-Jenkins, TE, General Core Soreness, Questionable: I’m trusting ASJ. He played in 88% of the Jaguars snaps and was Blake Bortles’s highest targeted receiver. How do I know that? Because I use the Razzball Depth Chart tool ya dingus! Sterling Shepard, WR, Back, Questionable: Limited in practice. Sadly kicking around that football on the sidelines. I think he’ll be in there. Michael Thomas, WR, Illness, Questionable: Any time I see the generic “illness” tag for a player, I assume diarrhea. Thomas isn’t missing his game this week. Start him. CJ Anderson, RB, Illness, Questionable: Oh no, diarrhea again! He’ll be starting — dirty drawers and all, but Anderson is buried wayyyy down deep behind Christian McCaffrey (57 snaps to 12.) Smells like a stinky situation to me. Rex Burkhead, RB, Concussion, Questionable: Burkhead didn’t practice Wednesday and now unfortunately he’s in the concussion protocol. With 3 RBs who are over 70% owned in fantasy leagues the Patriots aren’t hurting for help at the position. However, two of them, Burkhead and Sony Michel are questionable for their upcoming game against the Jaguars. I’d sit Burkhead this week. Patriots have other options if they want to give Burkhead less snaps this week even if he’s deemed clear to play. Marquise Goodwin, WR, Quadriceps, Questionable: I’m predicting Goodwin to be play, but be limited. He had a rough week last week with Jimmy GQ and I think we’ll be waiting until week 3 to see the sleeper potential we all predicted from Goodwin. Austin Hooper, TE, Knee: Questionable: He was a limited practice participant, but that’s not the issue here — Hooper had a disappointing 24 yards in week 1 and is now going to face off against the Panthers who held Tight Ends to the second fewest receiving yards in 2017. DeSean Jackson, WR, Concussion, Questionable: Boy these concussion ones are always tricky. There’s no NFL-governed process for a shoulder injury or something so unfortunately Jackson is at the whim of NFL doctors. The Eagles are a surprisingly exploitable match-up through the air, but the Bucs have the luxury of resting Jackson and leaning more heavily on Mike Evans, Chris Godwin, OJ Howard and Cameron Brate in the passing game. Marlon Mack, RB, Hamstring, Questionable: Mack missed all of week 1, but has been practicing in a limited fashion all this week. When I hear “limited practice” I literally just picture a player slowly kicking a football around the edges of the field. I’m expecting a start out of Mack but I think there will now just be another RB mouth to field and you shouldn’t start him until he does or doesn’t run away with this position. Sony Michel, RB, Knee, Questionable: If Burkhead is out then I could see Michel being deemed healthy enough to start. If Burkhead is in, Michel could be inactive again. The fact that this is so up in the air makes me feel as if you shouldn’t start Michel just yet. DeVante Parker, WR, Finger, Questionable: I don’t think Parker will be in the lineup. He’s practicing with a mitt over his broken finger which I imagine looks just like the hamburger helper mascot. Kenny Stills had a great game in week 1 and should succeed again. Danny Amendola will be there too — but only to distract the defensive backs from Stills. Doug Baldwin, WR, Knee – MCL, Doubtful: Captain Optimism Pete Carroll says Baldwin could be out a couple weeks. Even if he’s magically playing in week 2 you have to imagine he’s going to be limited. Plan accordingly. Alshon Jeffery, WR, Shoulder, Doubtful: We all draft Jeffery expecting him to miss the first two weeks and I think that diagnosis still stands. However, the fact that he’s even limited at practice is a good sign for week 3. Carson Wentz, QB, Knee-ACL, Doubtful: Still not taking contact in practice, not going to take contact in a game. Don’t start him ya turkey! Aaron Rodgers, Alshon Jeffery, Austin Hooper, Austin Seferian-Jenkins, Ben Roethlisberger, Carson Wentz, CJ Anderson, Corey Davis, Davante Adams, DeAndre Hopkins, DeSean Jackson, DeVante Parker, doug baldwin, Leonard Fournette, Marlon Mack, Marquise Goodwin, Michael Thomas, Rex Burkhead, Sony Michel, Sterling Shepard, Ted Ginn Jr.
Just a heads up.. The pop-up redirect ads are insane on the razzball football site. I can’t even read a paragraph and I’m thrown into an ad and have to open up your page from the very beginning. @toneDEAF! : ad blocker’s take care of this pretty well usually.